“It was chaos out there"
As part of the ongoing 25th Anniversary celebrations, Mazda entered a single MX-5 in this year's Nürburgring 24 hour endurance race. This event is held on the infamous Nordschleife circuit which is over 14 miles long and the most demanding race track in the world. Around 200 corners with countless bumps and kerbs need to be tackled constantly for 24 hours in the company of over 230 other cars. Fellow competitors include the Nissan GTR, McLaren 12C, Audi R8 LMS Ultra, Mercedes SLS AMG, BMW Z4, Toyota GT86, Subaru Impreza WRX STI, Aston Martin V12 Vantage, and Porsche 911. The race is regarded as one of the toughest in motorsport with a single lap in an MX-5 taking around eleven minutes, almost seven of which are at full throttle. 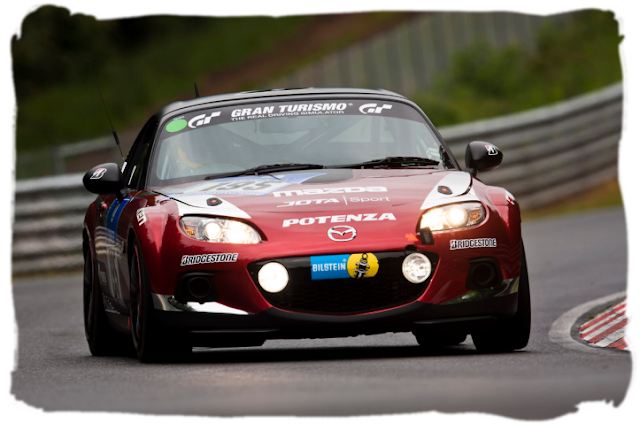 Long time Mazda Motorsport partners JOTA Sport were given the task of preparing and running the MX-5 race car. JOTA had won the LMP2 class at the previous weeks Le Mans 24 Hours, and hopes were high the experienced team could repeat that success here. JOTA assembled a multinational team of drivers consisting of Stefan Johansson (Sweden), Wolfgang Kaufmann (Germany), Owen Mildenhall (UK), and Teruaki Kato (Japan). The drivers were chosen for their experience of endurance racing, knowledge of the circuit, and knowledge of the car and its characteristics. Teruaki Kato won the Japanese one-make MX-5 race series and is also the owner of the TCR JAPAN (Teruaki Clubman Race) Roadster and RX-8 tuning shop previously mentioned in the NR-A post. With the driver lineup sorted, let's take a look at the car itself. JOTA started with a standard 2.0 6-speed soft top car and began to completely dismantle it. The bodyshell was treated to a chemical dip which removed around 16 kg of paint, sealant, and basically anything that wouldn't be needed on a race car. With the bodyshell back to bare metal, an FIA compliant safety cage could be welded in. These safety modifications are required before you can go racing and also included an onboard fire suppression system, electrical power isolator, tow strap, Sparco race seat, and 6-point harness for the driver. They also added some front spot lamps for improved vision through the night. The MX-5 was entered into the V3 class for 2.0 NA production cars which did allow for a few minor modifications but the engine and transmission were the same as found in the road car. Additional oil coolers were added for the gearbox and differential and an extra fuel tank holding 20 litres was mounted in the boot. Advan wheels with Bridgestone tyres and Ohlins suspension helped the car stay on the track. With the soft top removed the car was fitted with the detachable hardtop for improved aero, then given a black & red colour scheme similar to the 25th Anniversary edition. So that's the car, how did they get on? Well after qualifying an impressive fourth in class against the more powerful Toyota GT86, it was an eventful race to say the least. Stefan Johansson began the first stint but not even one lap was completed when the car was hit from behind, damaging the rear suspension and knocking the wheel alignment out. Later on, when Kato took over driving, the car was hit again from behind but seemed to be handling ok. The UK's Owen Mildenhall drove a great third stint and managed to get the car up to 5th place in the V3 class. This hard work was undone after a much faster Mercedes SLS AMG GT3 rear-ended the little roadster, destroying the rear suspension and forcing it back to the pits for an hour of repairs. To their credit JOTA's mechanics managed to completely rebuild the rear of the car and send it back out, though by now they had slipped from 126th overall to 144th. With some catching up to do, Kato was pushing hard through the middle of the night but disaster struck at 3.30am. Missing a braking point in the pitch black, Kato ran wide and crashed heavily into the barriers destroying the front end. Fortunately he escaped unhurt but the MX-5's race was over after 12 hours. It's a shame the car didn't make it to the end, but the team's experience shows just how tough endurance racing can be. As for the car, well considering it was pretty much standard, it's good to know the NC can run flat out around the Nordschleife for 12 hours without a single mechanical hiccup. You can see a time lapse of the build and some onboard footage in the videos below. There're also a few interviews with the drivers talking about the difficulties of driving one of the lowest powered cars and having to pay as much attention to what's behind as what's in front.